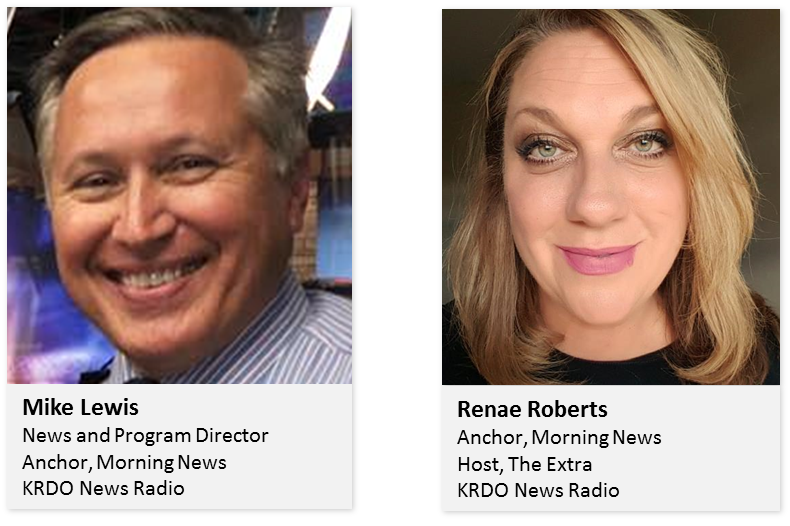 KRDO has been broadcasting in Colorado Springs for more than 50 years and has become known for accurate and trustworthy reporting, and, for representing only those advertisers we know will deliver a superior customer experience. KRDO’s ‘listener-first’ programming has been thoughtfully selected for tone and content, appealing to the broadest possible audience. There is something at KRDO News Radio for everyone. Mike Lewis has been with KRDO News Radio more than 20 years and has largely been responsible for the integrity of the KRDO News Radio brand in that time. His morning news co-anchor, Renae Roberts, has been on-air in the market for 20+ years as well. The pairing works well as both Mike and Renae have earned the trust of their listeners. Ultimately, our audience knows it can depend on each and every ‘recommendation’ we make with regard to doing business with our advertisers, each of whom, are vetted carefully before we represent their brands.